In fiery red, this torsade necklace is by Sumalee Nawakul. 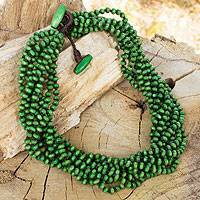 She crafts the necklace by hand with wood beads of littleleaf boxwood, creating 10 hand-knotted strands that twist into a necklace that can fasten at two different lengths. "I continue to help the older people from the foundation. They help me by binding and tying the cords calmly and beautifully." "Sawasdee ka, I'm Sumalee from Isan, in northeastern Thailand, and I come from a family dedicated to gardening flowers. As a child I helped by storing and jasmines as well as fresh banana leaves to sell in at the ceremonies held throughout the year in my village. "I remember sitting next to my grandmother when she was weaving silk. She planted mulberry trees and raised the silkworms herself. I would also help her as much as I could, by feeding the silkworms with mulberry leaves, boiled cocoons, etc. "When I was 10 years old, I moved along with my mother to Lampan, where my aunt lived. She wove cotton tablecloths, bedspreads, pillowcases, etc. Every evening after school, I would help her tie tassels on the bedspreads fringe. When I graduated the sixth grade, I wasn't able to continue unto high school with my friends because my mother did not have enough funds. "So, I worked at a Thai dessert store, starting as an apprentice until I could make several things. I was able to continue my studies and eventually got a vocational certificate in Accounting and I financed my studies by selling my aunt's products at the Night Bazaar. "After I graduated I worked for a Christian organization for 17 years. Their mission was to help those less fortunate. I met many people, most of them were older people who were unemployed and had no one to look after them. So, I arranged for simple jobs for them that could generate revenue for them as well as recreational activities to reduce their stress. "However, I became exhausted from work, so I decided to resign and I spent my savings investing in different things, such as a flower shop, a restaurant, a cafe, and a souvenir shop. However, since my only experience had been in non-profit organizations, I ended up losing most of my capital. 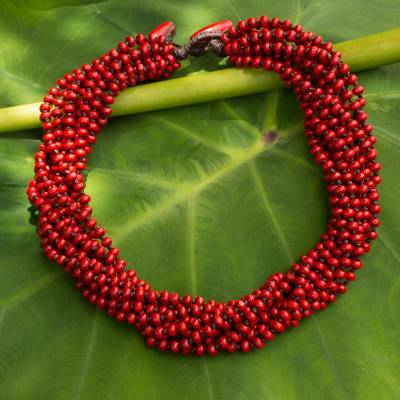 "One day, as I was walking on the street I noted some small wooden beads on a bag, and I thought that this was a material that is hardly used and yet was a good decorative accent. I decided to invest again, taking a risk with the money I had left. 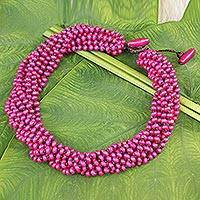 "I started with half a kilo of wooden beads and I started threading necklaces by hand. 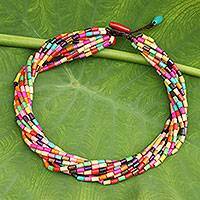 I made a few necklaces with bright, noticeable colors and I began selling them on the streets. My necklaces caught the attention of tourists, who liked them because they were affordable, lightweight, and beautiful. "And so my life revived! This time, I gradually added new designs, I was more careful with my money, and I promised myself that I would work as intended, and would not fail again. 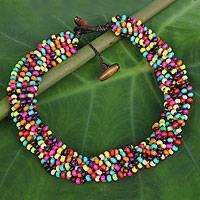 "My necklaces have been incredibly accepted because even though they are made from small wooden beads that look very ordinary on their own, when I thread them together the necklace can make the wearer stand out a lot. I continue to help the older people from the foundation. They help me by binding and tying the cords calmly and beautifully, for which of course they are handsomely paid. "Now I sell at Night Bazaar and a friend I made there has been very helpful with her timely advice. 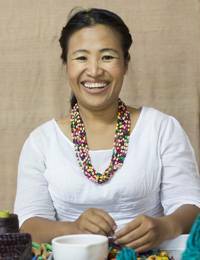 You may know her as a Novica featured artisan, she is Chirada and she is very glad to know that I will join the family of Novica. Hope all of you will welcome and support my works. Thank you."